The Burnout Project is coming soon! The Burnout Project will deliver packages to people struggling with burnout. The surprise packages will contain information, support, encouragement, and hope to guide them towards the journey of recovery. Recipients will be nominated anonymously by friends, family members, colleagues, or anyone else who has noticed that they are struggling. You can even nominate yourself! Fundraising is underway via Go Fund Me to source items for the first 100 packages. 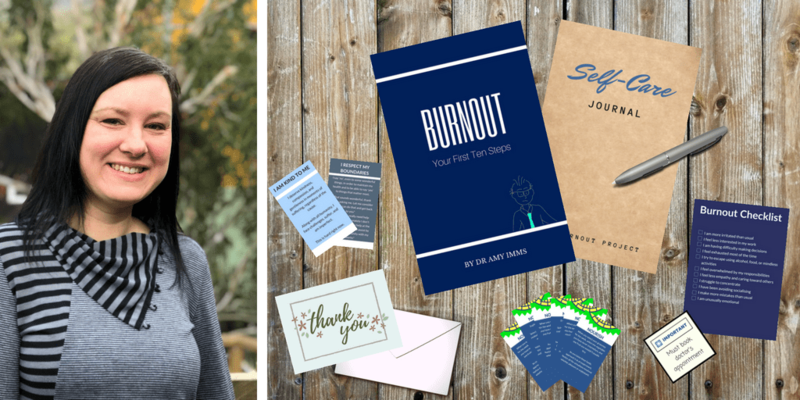 Packages contain a succinct, practical book about burnout and how to begin recovery, and materials to support progress through these steps. Supporting materials include a journal and pen, self-care and boundaries wallet cards, gift card, and access to online printable materials.. There will be a choice of nominating someone to be sent a free package, or purchasing the package. Purchased packages include an extra pampering element, including a candle, tea and soap. They will also include a few extra supporting materials, such as a printed workbook. The small amounts of profit made from purchased packages helps fund the free packages. Free package availability will depend upon funds available, and a waiting list may apply depending upon current supply and demand. I am a medical doctor in Tasmania, Australia, and I am passionate about mental health, particularly from a preventative and public health perspective. Burnout is a common experience, and can be hugely detrimental to people’s health and wellbeing. I believe that workplaces must take responsibility for creating a work environment that supports employees and facilitates optimal health and productivity, and does not cause burnout. However, as with many illnesses, this complex issue needs to be addressed at the individual treatment level, as well as the preventative organisational level. The Burnout Project is designed to help individuals to acknowledge or recognise that they are burnt out, and prompt them to take action and seek assistance. It is designed to show them that there is something that they can do about it, and give them hope. It will show them that someone else has noticed their struggle, and cared enough to nominate them. I have spent many hours preparing, researching, designing, and planning how to make this project most valuable for recipients, and I am ready to launch. The only remaining barrier is the funds to get the first phase started. Once it is up and running, the project is designed to be self-sustainable. If you would like to support this project, please head over to the Go Fund Me campaign. I want to thank you so much, in advance, for any support you are able to give. I know that there are many great causes worthy of donations, and that your decision to donate isn’t taken lightly. Your donation will allow me to use my passion and skills to touch the lives of those struggling and alone. If you would like to hear about progress with The Burnout Project and package availability, please complete the form below, or keep an eye on the Facebook page.